A quiz & some delicious MK Olsen bling. Many of the pieces are from Hoorsenbuhs jewelry. The people I’ve tagged are: Ashleigh, Charmaine, Cavaan, Abbey, Frances, Sabina, Andy and Kate. What is your current obsession? Destroyed skinnies, in any wash.
What is your weirdest obsession? Dark, eclectic circus acts, à la Cirque du Soleil. I love how cabalistic and mysterious every show is. And the costumes are wonderful, they really add to the overall mood of the performance. What are you wearing today? Black AA hoodie, thin Wilfred ribbed tank, grey skinnies, and black ballet flats. Nothing special. Why is today special? I had a personal revelation, and I connected with a soul mate in the wee hours of the morning. What would you like to learn to do? Fencing, acrobatics, and contemporary dance. What’s for dinner today? Something with zucchini I hope! I love zucchini. What’s the last thing you bought? A whooper from Burger King. But if we're talking clothes, then it was two pairs of destroyed skinny jeans from Zara. Told you I was obsessed. What are you listening to right now? I'm listening to Emperor's Concerto by Beethoven, conducted and played by Friedrich Gulda, on youtube. You must see it! What is your favorite weather? I don't have favourites. I know that's odd, but I can't designate that importance to just one thing/feeling/event/shade/object etc. What is your most challenging goal right now? Getting A's on all 5 upcoming exams this month. What do you think about the person who tagged you? She has great taste, and she's very kind and gentle. I know the latter sounds like something pretty deep to say about someone I've never met, but I can sense it. If you could have a house totally paid for, fully furnished anywhere in the world, where would you like it to be? Paris, rue de Sèvres near Le Bon Marché. What would you like to have in your hands right now? I didn't realize how superficial and materialistic I was until I came up with 5 answers to this question, all revolving around expensive clothes. Since I feel that wouldn't embody me as a person, I would love to have a large trust fund instead- one big enough to fund HIV/AIDS vaccination research to help the epidemic in Africa (South Africa especially, where > 15% of the population has acquired HIV). What would you like to get rid of? All my fried hair, which is actually half of my length, but I would like to so without cutting it. I adore long hair. So you see, this is a bit of a feat. If you could go anywhere in the world for the next hour, where would you go? Amsterdam to visit my friend Ruby. I met her in France last summer, and I miss her a lot. Which language do you want to learn? Italian. What did you dream of last night? What a coincidence, I actually did have a dream last night. Now this usually doesn't happen, because I forget most of them by the time I rise to greet the day, but this one had me in panic mode. I dreamt I was a victim of Visa Fraud! And I had a $7,400 bill to pay. I think this is due to the identity theft incident that happened to my best friend last week. Who do you want to meet in person? At this very second, Wentworth Miller. He's so intelligent and sage-like. Easy on the eyes too. One thing that you would snitch out of someone’s closet, with no regrets? YSL wedges that Ashley Olsen wore a few weeks ago. I love wedges, they're easy on my ballet-destroyed knees. What’s your favorite piece of clothing in your closet? Like I said, I don't have favourites. However, I really do adore my italian vintage ruffle skirt, and my tiny black muted-sequin vest (what a mouthful of adjectives there). Personal aspirations at the moment: Grow my hair longer, à la Willa Holland. I love the image of Mk's rings. Happy Holiday :) lady! I love reading these Q&A type things; I just answered a similar one a post or two ago on my blog! And I LOVE long hair too! A few inches of my hair are basically fried, but I don't want to cut it! 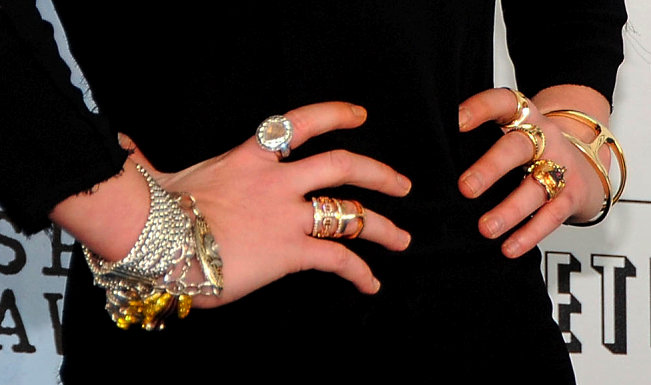 goodness i love all her rings. i love baking them, when they're drizzled with olive oil and dusted with parmesan cheese . thanks for the fun post! btw, love the lohan platforms down there. good choice. oooooh thank you! exciting haha! your pictures are like what I dream about, so fab. And I loved your answers, I'm itching to learn italian too. Trade links? Mmm I would love to learn another language. Italian sounds gooood. love those rings. and I love wedges too.. i need more in my life right now! i love those rings!! well done mk once again. I want to get all As next semester & A PERFECT GPA! Thanks fo tagging me :) I worked on the questions and posted them. and zucchine is amazing, i couldnt agree more. your blog is beautiful as is the bling bling bling by mk. Love the bling on MK hands ! Thanks so much for your uber quick response Chantelle! <3 you're the best darling! Hope you ever get those ysl wedges, haha. you've a great blog! ooooh i like the answers!! i’m from Brasil! Where are you from? destroyed skinnies - such a worthy obsession. that bling is insane. too bad very few people can pull it off without just looking gaudy as hell. I so agree with the destroyed skinnies obsession! And could I join you in that beautiful house in Paris? k so that beethoven you linked to is UNBELIEVABLE!!!!!!!!! thanks for sharing.